Go to preview and scroll down. Last Saturday a new exhibition opened at London’s Victoria and Albert Museum called “Ocean Liners: Speed & Style”. 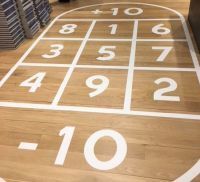 Brilliantly laid out, and spread over five halls, even the inevitable shop is fashioned in the art deco style that typified the great ships on the North Atlantic run during the inter-war years. Running until 17 June this is an exposition of not just the ultimate long-haul transport of its day, but also the way the very rich travelled and how the couturiers and finest architects of their time used their skills to evoke national pride on the sea. This extravaganza is for anyone interested in design and architecture, which of course the V&A embodies. Cruise fans will not be disappointed either, Viking being the main sponsor, its presentation discreet and the final display of a walk that takes you from Brunel’s Great Eastern of 1859 to a futuristic model of a 2020’s cruise ship. Co-organised by the V&A in London and the Peabody Essex Museum in Salem, Massachusetts, it is the first ever exhibition to explore the design and cultural impact of the ocean liner on an international scale. It looks at all aspects of ship design from ground-breaking engineering, architecture and interiors to the fashion and lifestyle aboard. It also highlights the political shifts and the international rivalry that developed over 100 years, as liners became floating showcases of national ingenuity. History enthusiasts will not be disappointed. The exhibition considers the sociology of ships and shifting class structures on-board, as well as the democratisation of travel and development of leisure activities in the 20th century. It investigates the shrewd promotional strategies used by shipping companies to reposition the on-board experience, as emigration gave way to aspirational travel. The ocean liner has been appropriated into pop-culture, literature and films, including Ronald Neame’s The Poseidon Adventure (1972) and James Cameron’s Titanic (1997), which remains one of the most successful films ever made. This, and the phenomenon of the modern cruise liner demonstrate how nostalgia for the great ‘floating palaces’ of the past can still be felt today. 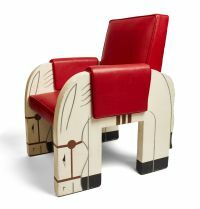 Ocean Liners: Speed & Style showcases over 250 objects, including paintings, sculpture, and ship models, alongside objects from shipyards, wall panels, furniture, fashion, textiles, photographs, posters and film. It displays objects never-before-displayed in Europe, and reunites items not seen together since on-board these spectacular vessels which revolutionised ocean travel from the mid-19th century until the arrival of the Jumbo Jet in 1969 with the Cunard Queens having made their last voyages. This was the year the QE2 arrived, designed for an earlier North Atlantic era. It took some time for it to find its rightful place in the market. No longer needed for Atlantic passages it was to mature as a fine, remodelled cruise ship. Hardly any mention of Queen Mary 2 at the V&A, surely the last of the true liners. But it is a living ship and now is perhaps not the time for a gift by Cunard to the Viking Cruises sponsored exhibition. The eventual Blue Riband holder, SS United States, does get a minor showing. The original still sits decaying in a Philadelphia dockyard. Video plays its part with a five-minute show of liner clippings from Hollywood, including Titanic and a hilarious Marilyn Monroe scene where locking herself in a cabin she tries to climb out through a porthole. Dotted around the exhibition are short film items show shipbuilding on the Clyde, RMS Queen Mary as a troop carrier and Oriont Lines social activities on the Australia run. A 40ft screen shows the Normandie at full steam, followed by QE2. Suspended in a very modern style are large video panels depicting the glamourous ladies of the period in their fabulous gowns parading down the grand staircases, a feature of all the liners. They are joined by the gentlemen of the time. 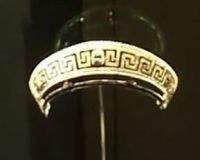 Highlights include a precious Cartier tiara recovered from the sinking Lusitania in 1915, as well as a panel fragment from the Titanic’s first class lounge, returning to the UK for the first time since its doomed maiden voyage in 1912. 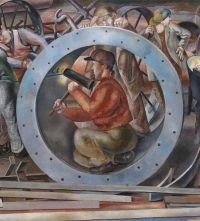 Others include a stunning interior panel from the Smoking Room of the French liner, Normandie, created by leading Art Deco lacquer artist Jean Dunand, and Stanley Spencer’s painting ‘The Riveters’ from the 1941 series Shipbuilding on the Clyde. 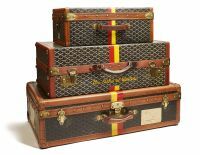 The Duke of Windsor’s sumptuous 1940s Goyard luggage also feature on display for the first time since leaving the Windsor Estate. This is just one example of the enormous efforts made by the show team and supporters in putting the exhibition together. It is priceless but will move on in June to the V&A’s Scottish outpost in Dundee. It opens on 15 September. 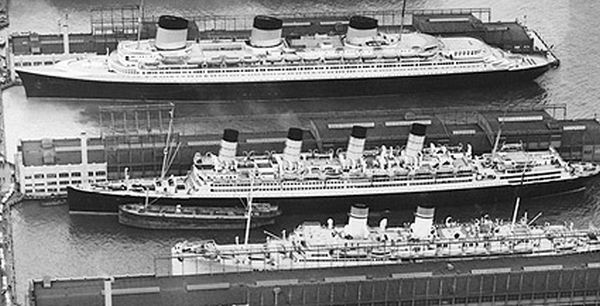 As the largest machines of their age, ocean liners became powerful symbols of progress and 20th century modernity. The exhibition also features ground-breaking works by Modernist artists, designers and architects inspired by liners, including Le Corbusier, Albert Gleizes, Charles Demuth and Eileen Gray. Beginning with Brunel’s steamship the exhibition traces the design stories behind some of the world’s most luxurious liners, from the Beaux-Arts interiors of Kronprinz Wilhelm, Titanic and its sister ship, Olympic, to the floating Art Deco palaces of Queen Mary and Normandie, and the streamlined modernism of SS United States and more traditional QE2. Perhaps the only thing missing is the photo exhibition on the current Queen Mary 2, acquired from its distinguished predecessor, with many taken (and developed) by that most famous of lab assistants Bing Crosby. He had access to the great and the good as they crossed the North Atlantic. Perhaps some of the Cunard archives could be borrowed for Dundee? RMS Queen Mary was after all built on Clydebank. 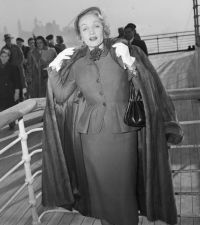 On display is a Christian Dior suit worn by Marlene Dietrich as she arrived in New York aboard the Queen Mary in 1950, and a striking Lucien Lelong couture gown worn for the maiden voyage of Normandie in 1935. The exhibition also showcases one of the most important flapper dresses in the V&A’s collection – Jeanne Lanvin’s ‘Salambo’ dress – a version of which was displayed at the Exposition Internationale des Arts Décoratifs et Industriels Modernes in Paris in 1925. The dress belonged to Emilie Grigsby, a renowned wealthy American beauty, who regularly travelled between the UK and New York aboard the Aquitania, Olympic and Lusitania throughout the 1910s and 1920s. Former MP, and Labour Shadow Secretary of State for Education Tristram Hunt, now director of the V&A, said: “I’m delighted that this dazzling exhibition, the first of its kind to explore the international design and cultural impact of the ocean liner, will be the V&A’s first major exhibition of 2018. This seminal show reveals hidden design stories of some of the world’s most luxurious liners, from the Titanic to the Normandie and QE2. We have collected ship-related objects and ephemera for well over 100 years, and now have a startlingly brilliant collection of ocean liner material, making us uniquely placed to present this exhibition”. Azamara Club Cruises, which calls itself “a boutique cruise line” has announced that its new ship, Azamara Pursuit, will be refitted in the UK as it prepares to go into wet dock at Belfast in Spring 2018. Azamara Pursuit will join the line’s existing two-ship fleet, after being transformed to be almost identical to its sister ships Azamara Quest and Azamara Journey. World-leading out-fitting specialist MJM Group will manage the entire refit project which will take place at the iconic Harland and Wolff shipyard in Belfast. Work will be completed by the end of July. This is the first time that Royal Caribbean Cruises Ltd, owner of the Azamara brand, has chosen a UK shipyard for such a project. The maiden voyage will depart Southampton on 1 August 2018 and travel to eight Norwegian destinations, including Kristiansand, Flam and Haugesund, with overnight stays in Oslo and Bergen. Azamara Pursuit’s sister ship, Azamara Journey, will dock in Haugesund on the same day, marking their first meeting. Azamara Pursuit will then depart Southampton for an Iceland-intensive voyage on 13 August, before a special christening voyage on 28 August. The ship will then depart Southampton once more on 30 August for its 13 Night Wine & Romance Voyage that completes in Barcelona. Celebrity Edge floated out of her dry dock at the STX France shipyard. With its river cruise style balconies, it may turn out to be the most innovative cruise ship so far this century. It is the first of a new class for the Miami-based company, part of Royal Caribbean Cruise Lines. Homeporting in Fort Lauderdale, FL, Celebrity Edge will be making her first sailing 21 November 2018. She will spend her inaugural season alternating seven-night eastern and western Caribbean itineraries before crossing back across the Atlantic for a series of seven- to 11-night sailings from Barcelona and Rome in 2019. Celebrity Edge will be joined by three sister ships in 2020, 2021 and 2022. Norwegian Cruise Lines (NCL) has published more details on Bliss with her maiden voyage, a transatlantic crossing from Southampton to New York, embarking 21 April. Following its popularity aboard sister ship Norwegian Joy in China, NCL is introducing a two-level electric-car competition circuit. The track, the longest at sea at nearly 1,000 feet, will clearly rev up the hearts of all who race around her many twists and turns with four-speed settings accommodating novice, intermediate and advanced drivers, reaching up to 30 miles per hour -- with a special "turbo boost" available on each lap. The electric cars run silent so as to not disturb those seeking to enjoy the serene environment. Virgin Voyages first keel laying has taken place at Fincantieri’s Genoa yard. Code name Virgin 1, the new ship is expected in service during 2020, followed by two sister ships in 2021 and 2022. Each will weigh about 110,000 gross tons, be 278m long and 38m wide. The ships will feature over 1,400 guest cabins that can host more than 2,700 passengers, accompanied by 1,150 crew members on board to deliver the famed Virgin service. Details are sparse, and it is early days yet, but you will have to be 18 years of age at least to cruise on this ship. You can be sure of some innovative ideas and design solutions and it will be interesting to see if the stateroom balcony design which Celebrity copied from the river ships, will be provided. Sir Richard Branson, founder of the Virgin brand was at the ceremony, held in the presence of the President of the Liguria Region, Giovanni Toti, the mayor of Genoa, Marco Bucci, and Tom McAlpin, President and CEO of Virgin Voyages. An excellent write up. I saw this wonderful exhibit at the Peabody Essex and expect to see it in London in May. Correction: "Orion Lines social activities" should be Orient Line's.